We arrived well after dark, and set up tents by flashlight. The villagers gathered. 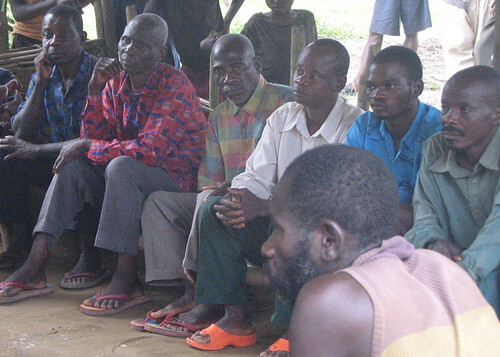 Like PolePole, where we slept the night before, Bene Kamba has about 20 households, tiny clearing in a vast forest. Exhausted, I left Dino explaining our mission and crawled into my tent, zipped it shut and immediately fell asleep. I woke sometime deep in the night. Silence, but for a simple melody. I had to get my bearings. “I’m on my sleeping mat, in my tent, in a tiny village along the Lomami” But the melody persisted. I realized it must be a flute. The wonderful rills filled the still night. Skeptical, but ready to listen. In the morning we were all thinking of other things. The villagers gathered on the roughly hewn benches of the barraza or pulled up rattan stools. Dino led the village meeting. He does a great job. In response to the inevitable statement: “All we know how to do is hunt, we have no other livelihood.”, he reminds them of facts all the elders know already. Without hunting seasons the wildlife will disappear. In fact, other parts of the forest are already “empty”. Many eventually admit that regulation is overdue. The forest needs to recover and only closing it to hunting will allow that. 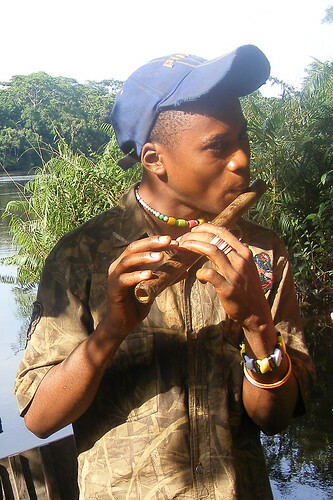 That afternoon as we were breaking camp, I remembered the flutist. I asked who made the night music and a young man stepped forward. Smiling shyly he showed me his home-made bamboo flute with five finger holes. We walked together to the dugout. His name : Jolice. Jolice’s own world of music along the Lomami. As the boat was loaded, and amid the chatter and shouts, Jolice stepped to the side and played a little serenade. He continued as we pushed off. The melody followed us out over the water. Certainly, an artist. This still was taken just before the video above. This entry was written by Terese Hart, posted on 2009-05-18 at 12:06 am, filed under About the project, Bushmeat. Bookmark the permalink. Follow any comments here with the RSS feed for this post. Post a comment or leave a trackback: Trackback URL. I hope the option we have now put up works for you. Let us know if there is a problem.